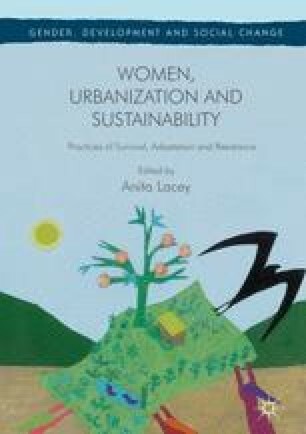 Women’s trajectories in and out of urban water poverty are located at varying intersections of class, citizenship, age, ethnicity and other social categories and identities. Previous work by feminist researchers has demonstrated how women’s experiences and their possibilities in life differ depending on these intersections. This chapter examines how three women and one man in two informal settlements in Lima (Peru) and Dar es Salaam (Tanzania) experience water poverty in their daily lives and seek water justice. Drawing on primary research, the chapter adopts a portraiture approach to weave an intricate outline of how these four people navigate fuzzy water entitlements in these two cities. The discussion shows how gender cannot be understood in isolation. As a practice it intersects with issues of urban life to create gendered trajectories that explain why and how some women can escape water poverty and activate their right to water while others cannot. In doing so, we adopt a dialectical perspective to explore how an intersectional approach can go beyond enduring individualist and reductionist assumptions linked to Western liberal underpinnings embedded in water interventions. The discussion posits the need to include a robust conception of the social world in which change depends on shifting power relations, and individual agency is shaped by power or social forces as well as individual will. Golsteijn, Connie, and Serena Wright 2013. Using Narrative Research and Portraiture to Inform Design Research. Lecture Notes in Computer Science (Including Subseries Lecture Notes in Artificial Intelligence and Lecture Notes in Bioinformatics) 8119 LNCS (PART 3): 298–315. doi: 10.1007/978-3-642-40477-1_19. Hankivsky, Olena 2012. Women’s Health, Men’s Health, and Gender and Health: Implications of Intersectionality. Social Science & Medicine 74 (11). Elsevier Ltd: 1712–20. doi: 10.1016/j.socscimed.2011.11.029.